If you want to transform your great outdoors into a special place where you can make lifelong memories with friends and family, there are several things you can do. Landscaping such as flower beds and topiaries are one popular idea. So is hardscaping, including retaining walls, patios, and custom fire and water features. Another option that many homeowners don’t consider until they see it firsthand is landscape lighting. Thoughtfully installing a lighting system in strategic locations around the outside of your home is a great way to enhance your home’s features and show off your landscape. Keep reading to find out what else landscape lighting can do for you and your home. If you are someone that likes to welcome friends and family into your home around the holidays or just because, landscape lighting can help make those experiences even more special. By lighting up the outdoor spaces of your home such as your back patio, you can bring the comfort of indoors outside. Especially when paired with features like comfortable seating, a fire feature, or an outdoor bar, landscape lighting can help you and your guests create great memories. 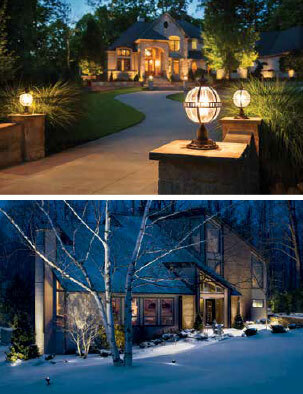 One underappreciated aspect of landscape lighting is the fact that it enhances the safety of your outdoor surroundings. Whether you have footpaths leading from a garage to the main house or you simply want to be able to see everything around you when you let the dog out at night, having your landscape lit up in a way that is calculated and purposeful really increases the safety of your surroundings. Perhaps the most obvious benefit of exterior landscape lighting is the beautiful effect it produces on your home. Whether it’s in the middle of summer or in the dead of winter, having lights shining on your home and landscape creates a pleasant visual effect that highlights the most beautiful parts of your home. With professional design and installation from our experts, landscape lighting will create a look that you will enjoy for years to come. While everyone loves a beautiful home, most homeowners would agree that security is priority number one. The great thing about landscape lighting is that it enhances both beauty and security. By having outdoor lighting directed at the darker areas surrounding your home, including bushes, corners, and garage doors, you can feel that much more at ease knowing that those areas are illuminated and that you and your family are safe in your home. So, what are you waiting for? Start enjoying your great outdoors even more with landscape lighting installed by the experts at SunCo. Get in touch with us today to learn more.